LOG_WALKER (Wausaukee, Wisconsin) on 2015-03-19 16:28:23.
dmacleo (Etna,ME) on 2015-03-05 14:43:16. I liked it, am a fan of rotaries so it was expected I would. The talk that Steve Lee did inside the cab pointing stuff out was very interesting to me. Steamboy (Revere MA US) on 2018-03-16 03:43:03. 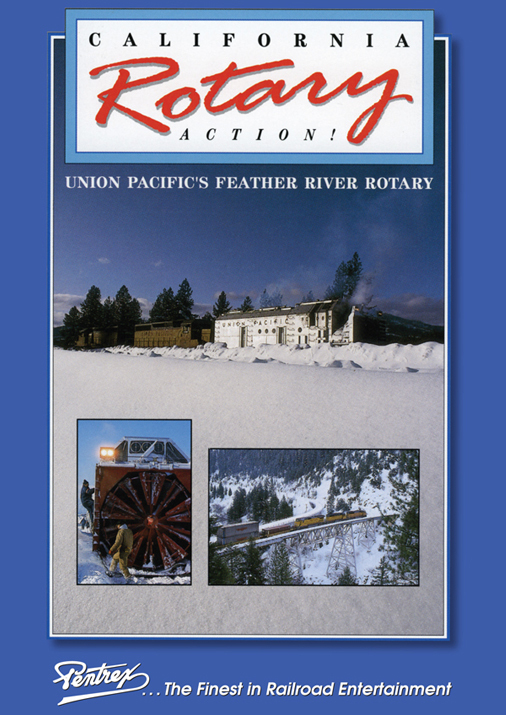 25 years later today, this program features some decent action between Portola and Orville, as not only the rotary makes an appearance, but also some freights are shown as well. There is a mistake on the cover that I just want to point out. Pentrex thought that this was a 45 minute video, but according to my vcr, it�s actually a 55 minute video. Oh well. The Scotsman (Foresthill, California) on 2015-01-18 13:15:28. Museum (now known as the Western Pacific Railroad Museum). I saw the UP Plow arrive. Yard. I talked to the crew several times during their stay in Portola including Steve Lee. I didn't know the plow was headed for Stockton Shop for repairs until it returned to Portola. I then found out what was damaged on the plow. This is my review. I have had the opportunity to work with Steve Lee before his retirement. An enjoyable experience. The Snow Removing operation at Portola was an absolute necessity. The yard was plugged and no more room for the spreader to shove the snow. I am a fan of Rotary Snow Removal equipment, both Highway and Railroad. Many years ago, I was a Highway Rotary Plow Operator. a great experience! I would love to operate a RR Rotary, but I can't. I'm disabled. Can hardly walk walk!